In part one we looked back at an article published 10 years ago in Wavelength where we asked various industry experts to predict who were the likely up and coming QS contenders. Read it here. Here in part two we’ll gaze deep into our crystal ball and, with the help of a few current industry big hitters, throw out some predictions as to who the the future starts of British surfing will be. The most common thread that ran through the stories of those featured in the previous article was a move towards a free surfing career, rather than a competition driven one, and much points to this continuing over the next decade. 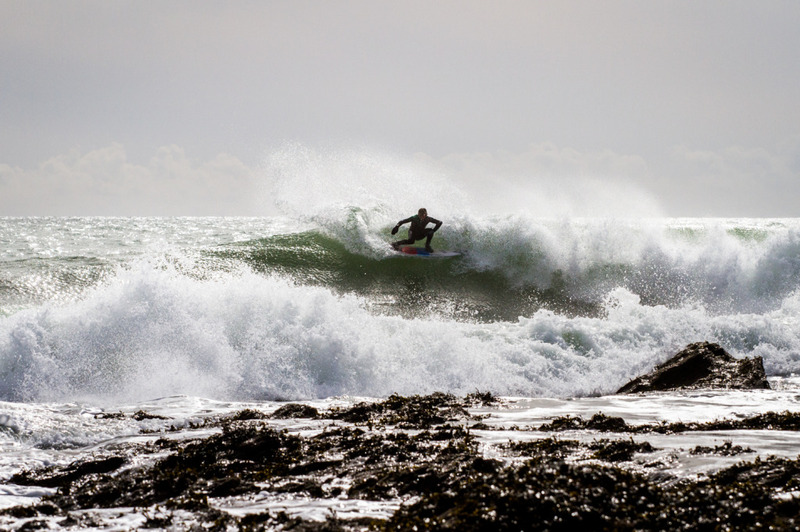 As well as huge amount of natural talent navigating the current competitive sphere requires some very specific personality traits, including an unwavering amount of drive and competitiveness, which done’t always reside in those who chose surfing as their main passion. To gain the necessary support requires a sufficient amount of self belief to convince a company to shell out thousands of pounds on sending you round the world to compete, where before you reach the highest level, you will be part of a large field and seen by relatively few spectators. Naturally then, companies may well prefer to pay a British freesurfer’s travel expenses, which often just amount to a yearly trip to Indo and a few jaunts around Europe. 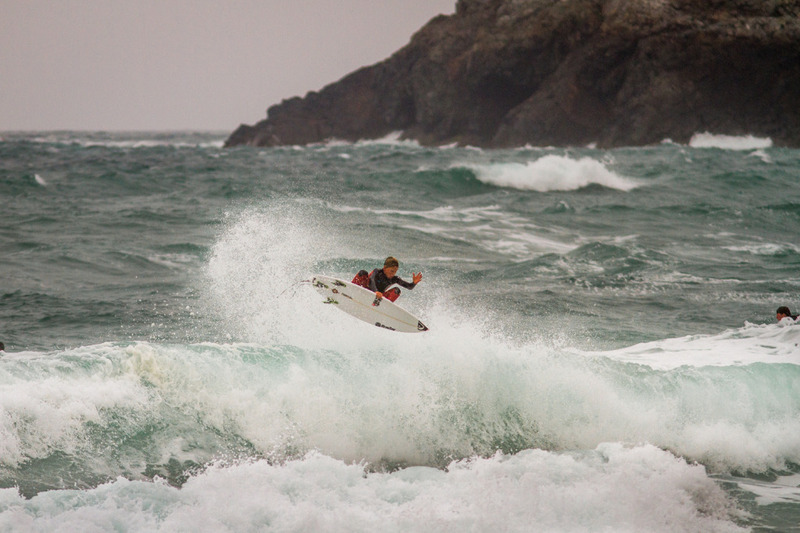 Nick Rees, operations manager at Surfing GB, also agrees there is currently not a good enough system in place to give kids the opportunities they need, particularly to achieve competitive success. However with Surfing’s inclusion in the 2020 Olympics and lots of work going on behind the scenes by Surfing GB to inject more funding into youth development in the sport, the organisation hopes this could all be about to change. When it came to throwing out some names for the under 12’s there was a consensus among our respondents that whilst there were a few in the upper end of the age category who were worth watching (namely Sam Hearn, Bertie Norman & Thomas Reeves) the most exciting prospects come from the generation just below them. “There’s more under 10’s surfing through winter now than ever before and more kids who’ve got active and interested surf parents” said Joel, throwing a specific mention to the sons of European champs Ben Baird and Ben Skinner, selections which British pro’s Oli Adams & Sam Lamiroy also concurred with. Here’s Oli’s take: “I was just on holiday in France with Lucas” who is Skindog’s 8 year old son and Oli’s nephew “and something just clicked with his surfing. I could see a future star in the making. He already does massive airs on a skateboard and he was surfing really fast with carves, reos and even popping rad little airs. However he could go down any route as skating is his first love so it’s hard to predict, but exciting to see what happens”. Realistically, the group agreed, it is this generation that is most likely to produce a WCT level surfer. Stan Norman throwing a lofty full rotation. He’s undoubtedly got the makings of a very good aerialist. 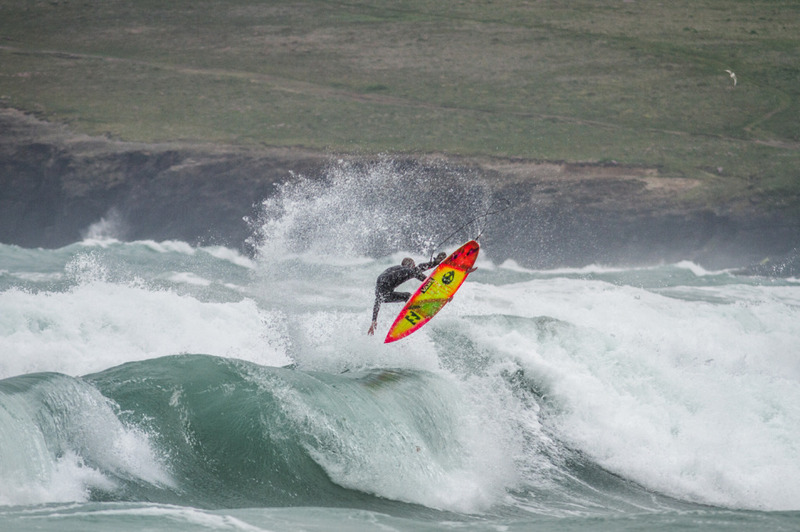 15 year old Kit Innes was another name to crop up consistently. Kit has been on a competitive winning streak recently within the UK and his athleticism and raw talent are touted as second to none in his age category, with Ed Corkhill who runs the fitness training section of the Oli Adams’ surf academy calling him one of the most naturally athletic 15 year olds he’s ever come across. However Kit still has three years left on the Pro Junior and so the real test will be as to whether he has the ability and backing to achieve the results he needs in Europe to take his competitive surfing to the next rung of the ladder. Will Masterman (pictured in the cover shot), Barnaby Cox, Frankie Bamford & Sol Hawkins are also ones to watch in this age category. In the under 18’s category Harry De Roth, Angus Scotney & Liam Murray Strout were the main mentions. Whilst all three are currently competing on the Pro Juniors, each are at a cross roads in their career when they are taking decisions on whether to focus on a competitive, freesurfing or a move away from surfing for a job all together. 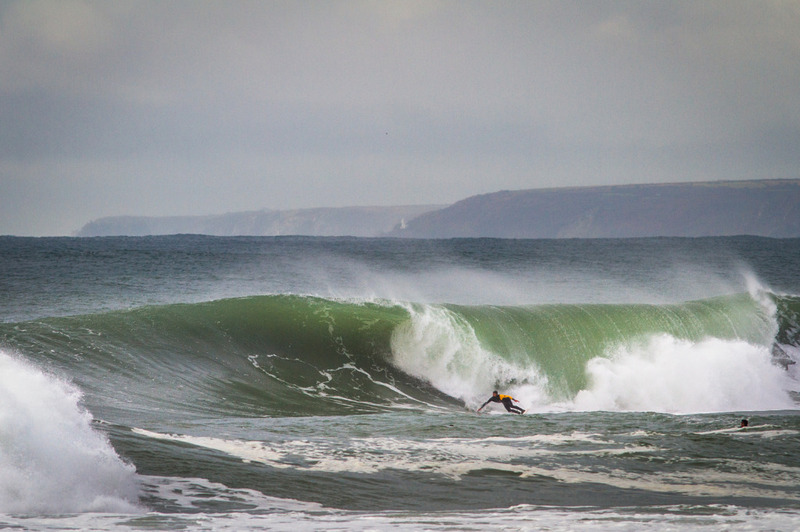 Harry De Roth with a cruisey bottom turn on a South Coast bomb this winter. To me Liam has always looked like more of a free-surfer, with a super photogenic style and solid air game, however as Joel identifies, these are traits that can just as easily be transferred into competitive success with the right desire and focus. Harry looks perfectly equipped to do well in a competitive arena with a solid power base, and a consistent & diverse repertoire which have already garnered him a few keeper results on his last year of the Pro Juniors. However he will need to find a few more solid results if he is to receive the backing required to join the QS. Angus has decided to go to Uni in Cardiff next year to study sport and physio, but will hopefully continue to compete along side his studies. In the girls Peony Knight is right up there with those in Europe her age and with continuing progression and support will almost certainly make it onto the QS. For us at Wavelength, variety is the spice of life and whilst we’d love to see more Brit surfers competing at the highest levels, we’re also thoroughly entertained by clips of the boys abroad, pushing their surfing in better quality waves- an approach which I believe is more likely to lead to the overall progression of areas the sport that are not necessarily favoured by judging criteria at the lower levels, such as big and technical airs. We agree we bare a responsibility to cover, encourage and support up and comers and hope that brands and (perhaps most importantly) governing organisations understand what needs to be done from their end if we want the next 10 years of British surfing to be something we can all be proud of.